Municipal water systems can be complex, with multiple pumps, tanks, valves and miles of pipelines. Unfortunately, in many municipalities, water facilities are aging, and neglect of water systems is exacting a steep price. According to the Center for Neighborhood Technology, an estimated 6 billion gal of clean drinking water per day is wasted because of antiquated water systems. In an era of tight municipal budgets, the efficiency of the water and wastewater network must be maintained for costs to remain in check. A sound water network needs to address the challenges of leakage control, pipe repairs, pressure management and asset management. Tega Cay, S.C., a small city of 8,000 residents, faced the challenge of providing its citizens with a reliable and stable but cost-effective supply of freshwater. To cut costs, the town bought water from a less expensive secondary source and needed to bring the system online. To access the secondary water supply, the town required the construction, control and monitoring of water tanks and booster pumping stations. The pumps fill the tanks, and water flows to consumers as needed. In this instance, the pumps and tanks were located miles away from each other. Many small water systems traditionally link to each other via existing copper telephone wire networks that are leased from the telephone company. In this basic setup, the lines act as control electrodes in which a signal from a tank turns the pumps on and off. However, the copper telephone wire network was deemed a risky solution because copper wire networks are being phased out as phone companies are replacing copper lines with fiber-optic cable. Tega Cay town officials turned to a municipal water and wastewater control systems specialist in Kinard Control Systems of Newberry, S.C.
“When phone companies make the decision to pull out their copper wires, they give you about two weeks notice before they replace a line,” said Brian Kinard, Kinard Control Systems president. Such a situation leaves residents without access to water and the decision is made without any local control or input. After evaluating Tega Cay’s water distribution requirements, Kinard proposed a solution based on the Siemens S7-1200 programmable logic controller (PLC). This controller is compact and well-suited to small applications like Tega Cay’s. Totally Integrated Automation (TIA) Portal, an user-friendly engineering framework was a second part of the solution. Siemens WinCC supervisory control and data acquisition (SCADA) system was the final element. The entire system used computers, networked data communications and graphical user interfaces to perform high-level supervisory management processes, and gave the city of Tega Cay more control and monitoring capabilities. 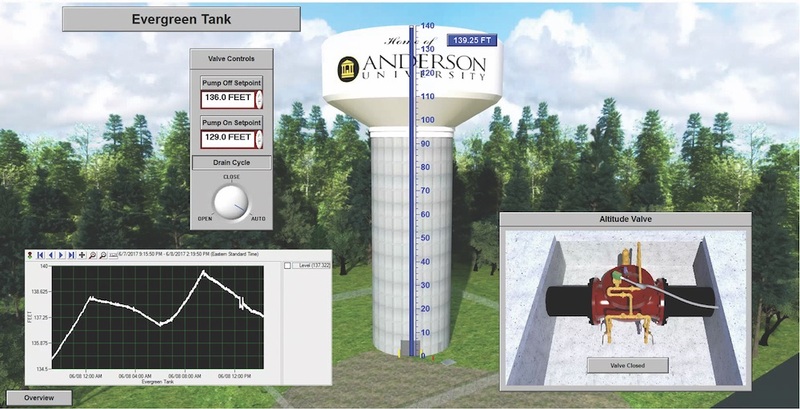 Because the main components of the water system were located miles from each other, a decision was needed on how to best connect the system. Based on the local terrain and location of cell towers, Kinard proposed a radio telemetry communications system to help system monitoring and control. Radio telemetry is a real-time technique that uses radio waves to transmit information from a distant instrument to a device that indicates or records measurements. 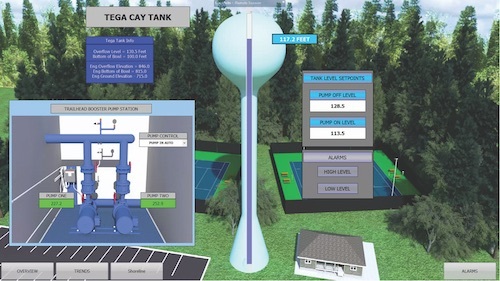 In the case of Tega Cay, the radio telemetry system links the SCADA components to enable remote monitoring and control. Kinard configured a solution consisting of pumps, sensors and programmable logic controllers (PLCs) connected through a standardized panel developed by Kinard engineers. The equipment was installed at four remote locations. 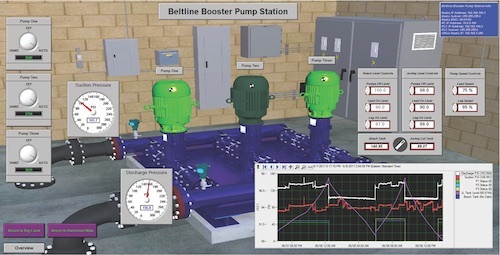 The system was designed to monitor and manage two new booster pumps that fed some existing aboveground water tanks. Each site transmits data to each of the other sites and also to the master human machine interface (HMI), which is based on the WinCC SCADA system. Variable tank setpoints enable precise control over system operations. When the city decided to add an HMI component to its system, some reprogramming had to take place. Libraries and modules developed for other solutions already existed, and using a the TIA Portal tool, Kinard was quickly able to implement the changes. According to Kinard, the products improved project development and deployment speed in other ways. It was possible to have the PLC host a web page, which enabled access through any browser on any device. As a result, troubleshooting could be performed remotely. Kinard experienced this remote capability with Tega Cay when operators indicated they wanted to log into the system without using cumbersome methods that only allowed one person to log into the system at a time, or required a difficult login for access. Kinard logged into the Siemens system at Tega Cay and enabled the WebUX client. Within an hour of its conversation, Kinard sent Tega Cay the link, user name and password to log in using WebUX. “Siemens made remote troubleshooting and access so easy for us and our clients,” Kinard said. Most PLCs require connection to a serial cable and assigning an IP address to the controller. This allows for communication to and from the PLC without integrating to the internet. Under such a scenario, developers must assign an IP address and release it, doing so repeatedly during development. Adding a secondary site requires additional PLCs, further complicating the process. The TIA portal triggers a search for the PLC and automatically adds the appropriate IP addresses through a secondary domain name server (DNS). This DNS allows developers to communicate to the PLC while retaining the ability to seamlessly communicate with the wider internet, enabling access to all the resources needed when creating and rolling out a solution. As other sites are added, the software inserts them into this secondary DNS. All of this occurs automatically in the background without having to involve time from the engineer. The solution for Tega Cay uses radio telemetry to convey information to the SCADA system that uses networked data communications and a graphical user interface to clearly display data for operators to analyze for facility management. The expertise of the Kinard engineers in the domain of instrumentation and sensors also helps its customers. For instance, having sensors in the right place can help diagnose problems, such as when a sticky valve causes a pressure spike that makes pipes leak. By placing the instrumentation in the right location, problems can be discovered and fixed. The TIA Portal drives full scalability from basic through to the mid- and high-range controller families. An integrated Profinet interface ensures flexibility. Also, with functions that range from counting and measuring, speed, position and duty cycle control, and remote I/O through simple process control functionality, it can operate in an array of applications. A fail-safe version for safety-related tasks is an option, and in both versions, security is integrated in the form of comprehensive access, copy and manipulation protection. 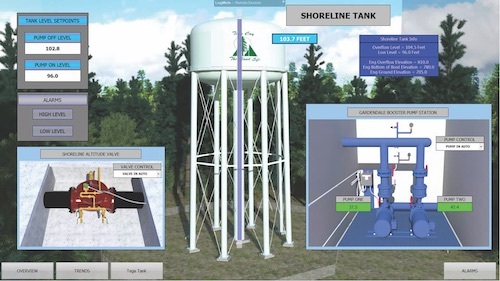 The engineering knowledge of Kinard Control Systems, the PLC and the optimized design of the SCADA solution helped Tega Cay achieve its water availability goals while reducing its operational costs. Now the town’s water customers are seeing lower water bills. In the future, they may see even lower costs and experience fewer instances of downtime because of the modernized SCADA system.